Why Doesn’t My Denture Fit? When teeth are missing, the mouth is still constantly changing shape. This is because teeth are no longer stimulating the jaw bone, which prevents the bone and your overall jawline from changing shape. 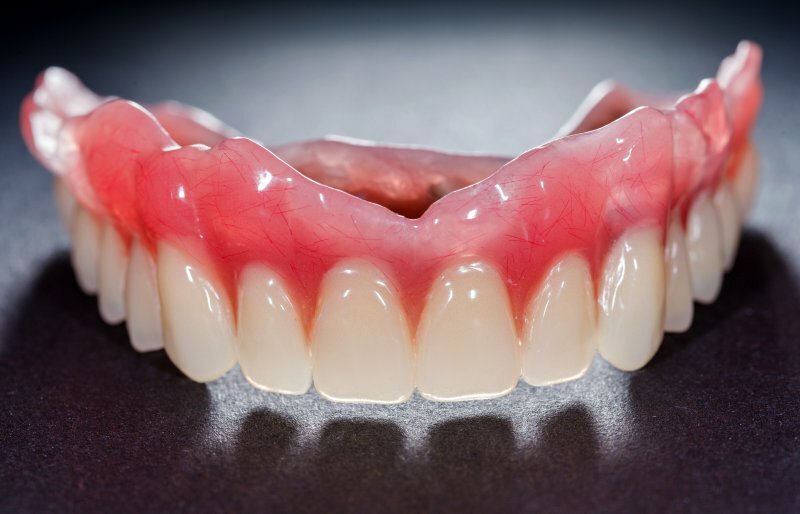 As a result, relinings and replacement dentures are needed every several years to ensure proper comfort. If you haven’t been to the dentist in a long time or have relied on your current denture for many years, it may be time to consider a replacement. If you find yourself keeping your denture in a drawer somewhere and not in your mouth, it may be time to make an upgrade. Additionally, dentures that cause sore spots, feel loose or look considerably worn out should be replaced. Pay close attention to the porcelain teeth inside your denture for chips, cracks, discoloration or other signs of wear. In some cases, they may not even require a full-blown replacement, but a reline instead to make them fit more comfortably. It’s important to note that ill-fitting dentures are not just putting the condition of your mouth at risk. They can also cause issues with your digestion. If you aren’t able to chew foods as well because your denture is loose or because you aren’t able to wear them all the time, you could experience malnutrition or stomach problems as a result. Loose dentures could also dramatically affect your facial features, such as your cheeks or jaw. If your denture is ill-fitting, the best thing you can do is schedule an appointment with a dentist. Not only can they examine their current fit and condition, but also recommend a denture that best fits your mouth. Don’t try to repair dentures yourself as the materials you find in pharmacies are nothing like materials you’ll find in a dental office. Denture adhesive should not be used to substitute a relining or replacement denture in the long-term. Dentists always make sure to create a denture that fits your mouth’s current shape. Don’t settle for an ill-fitting denture when your oral and overall health is at stake. Schedule an appointment with a dentist to get started building your new more comfortable smile! Dr. Greg Friedman earned his dental degree from the Washington University School of Dental Medicine. His office provides full and partial dentures to those struggling with an ill-fitting denture and always makes sure patients are comfortable with their final prosthetic before leaving the office. To learn more about his practice, you can contact him through his website.